A lot of pixelated modern platformers often call to mind other classic games of the past. The Metroids, Marios, Mega Mans, Castlevanias, and so on of the 80s and 90s. Few, though, ever gesture toward another figure in Nintendo's history, and as a result, it's poor little Kirby that's left to weather its own destiny, its own games; left to hold onto its own inspiration of itself, with no one to share with. Today though, a new game on Nintendo Switch and PC is grabbing hold of Kirby and not letting go, and it's called Save Me Mr Tako: Tasukete Tako-San. Save Me Mr Tako first grabbed people's attention during a Nintendo Direct aimed towards "Nindies," Nintendo's own play on indie games on its platforms. At first, Save Me Mr Tako looks like something that'd end up on Nintendo 3DS, akin to the smaller-scale indies such as Pushmo in the past. Instead, Save Me Mr Tako is a full-on platformer-adventure game for Nintendo Switch, with a story, levels, bosses, and more at its behest—only it looks like it could be on the original Game Boy. In fact, that's where a lot of its charm comes from. It's an 8-bit game with a familiar default color palette: green and greener, with many shades of olive that complement each other. With just the tap of the right bumper, you can change the color palette in an instant. Palettes bounce from four shades of some random color, like the aforementioned Game Boy's, to even more colors, such as a nice one I've mostly stuck to of salmon, pale yellow, and lavender. In Save Me Mr Tako, you play as Mr Tako, an unassuming octopus with an earnest life goal to end the war between humans and octopi. Mr Tako has a meter for ink, which he can spit at enemies to make them blinded and thus too terrified to move. (At least, that's how I'm choosing to see why the black-splattered foes stay still for a limited amount of time, like a rock.) 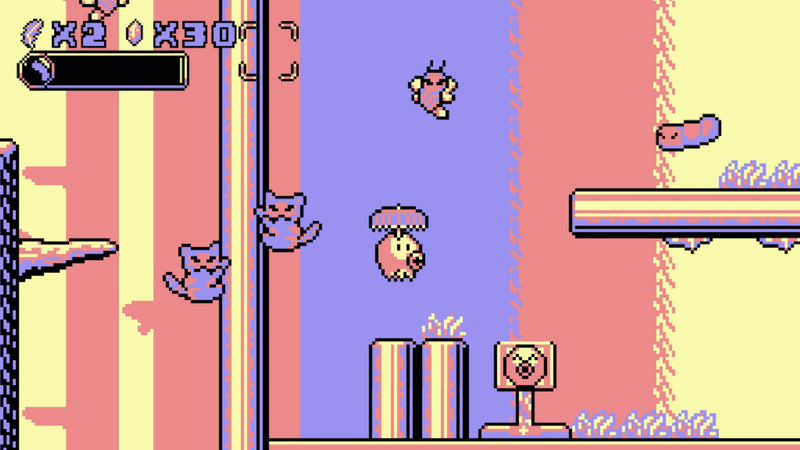 In navigating levels, inking up enemies becomes essential in not only defending Mr Tako, but in configuring ways to reach higher up areas by using inked-up enemies as platforms too. But it only gets more complicated as the game goes on, when a Kirby-like element is introduced. Much like how in Red Dead Redemption 2 you can pick up the hats of the men you murder, you can don hats in Save Me Mr Tako too. 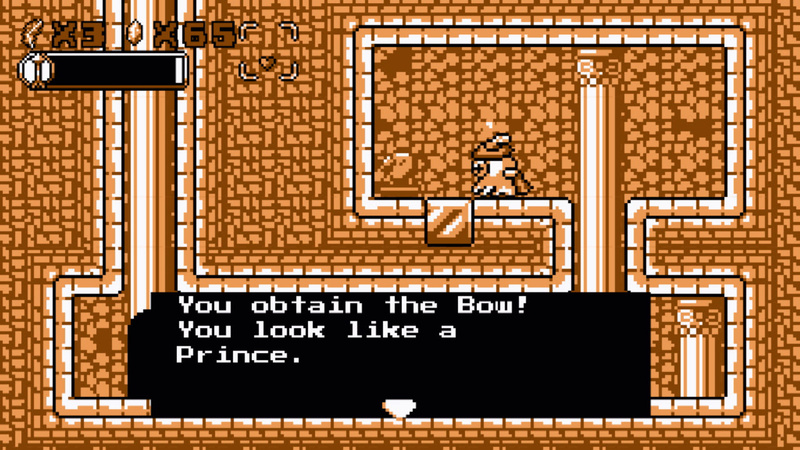 Hats gives Mr Tako special abilities, like making him into a Link-like figure complete with a Robin Hood-ish hat and a bow and arrow. It's the hats that make Mr Tako powerful. And it's the hats that remind me of the time where I played Kirby: Nightmare in Dreamland almost every day. For that, Save Me Mr Tako is unexpectedly refreshing. We've played so many Mega Man-likes, Mario-likes, any-classic-platformer-you-can-think-of-likes in the past decade, but I can't recall any recent indie platformer that's a throwback to a simpler era of gaming—specifically that of the pink, hungry ball of joy that is Kirby. The closest is maybe last year's 3D platforming hit, Super Mario Odyssey. It's another Nintendo game, wherein Mario throws his hat onto enemies and becomes them, rather than swallowing them whole and absorbing their likeness as a result. It's not quite 3D Kirby, but it's close enough. Save Me Mr Tako, judging solely from a platformer-metric, is only just okay. It's the dressing that's set up around it that's kept me glued for nights on end all week long. It's the different abilities hats net you, which weirdly reminded me of the abilities you quietly discover in the freeware game Yume Nikki. It's the create-your-own-path way of ink-splatting enemies, helping Mr Tako reach secret areas, sometimes avoiding large swaths of enemies below too (though, not quite erring on Mario running along the top of a level screen). Save Me Mr Tako isn't the sort of platformer that depends on precision either, sometimes to an annoying degree, but Mr Tako's floaty jump fits with the Kirby style it's so prominently reminding me of. I even forgive it a tad, except for when I tumble downwards and have to re-ink some enemies to get back up to a high perch. Save Me Mr Tako has six worlds to explore in total, along with 50 hats to collect (all with unique perks and abilities), and even side quests to take on in the hub areas. It's overall an incredibly charming game, if maybe a little bit too twee for my taste in terms of its writing. It doesn't hinder things much though, combining its clever make-your-own-platform ink mechanic with strapping on a new ability at a whim, Kirby style. If Save Me Mr Tako advocates for anything aside from tolerance and unity between different species, it's that history shouldn't forget the Kirbys of the world. As proven by this adorable little octopi-led adventure, Kirby's worth an influential peg too. Tagged with Analyses,	Christophe Galati,	Game Boy,	Nicalis,	Nintendo Switch,	Platformer,	Retro.